In March, China's trade surplus turned into a deficit, prompting some pundits to proclaim that China's economy was rebalancing. Others pointed to a surge in auto buying as proof consumer demand in China was picking up steam. I did not buy either of those arguments, and instead proposed the numbers were indicative of collapse in US demand for Chinese goods coupled with massive surge in Chinese buying of commodities at ever increasing prices. China’s trade surplus declined in the first quarter, and during March the country ran a deficit of $7.2 billion, its first monthly trade deficit since 2004. Contrary to some analyses, this is not proof that the economy has made significant progress toward rebalancing or a reason for the United States to back away from pushing China on yuan appreciation. The short-run decline in the trade balance was driven by seasonal effects, a slowdown in China’s export markets, and a surge in raw materials imports - none of which indicate that China is making a transition to an economy driven by greater consumer demand. On the contrary, a breakdown of trade figures indicates that although demand has returned, it is largely related to investment-led growth, not to consumer demand. Weak export growth was a consequence of weak recoveries in the European Union, United States, and Japan, which accounted for 46% of China’s exports in 2008. Even though exports to the EU, US, and Japan increased by 25%, 17%, and 19% YOY in March 2010, these gains barely made up for the decline during the previous year. 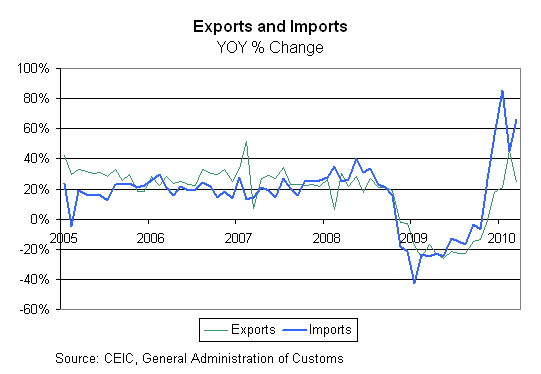 In other words, exports to China’s major trading partners have remained flat since 2008 (see Chart 2). While export growth remained subdued, import growth has surged. But the increase in imports reflects an intensification of investment-driven growth and demand for commodities and materials, not a move to greater consumer demand. Fixed asset investment grew 25.6% in the first quarter of 2010 compared to the first quarter of 2009. Partly as a result, China imported $27.6 billion more commodities and materials in March 2010 than in March 2009, an increase of 77.1% YOY. This was the major driver of the $25.8 billion decline in the trade balance during the same period. Evidence of Consumer Goods Imports? Motor vehicles imports have soared on the back of strong government subsidies and increased demand, but imports of other consumer goods have not grown as quickly and in some cases have declined. During the last six months (October 2009 - March 2010), motor vehicle imports increased 211% from the same period last year. 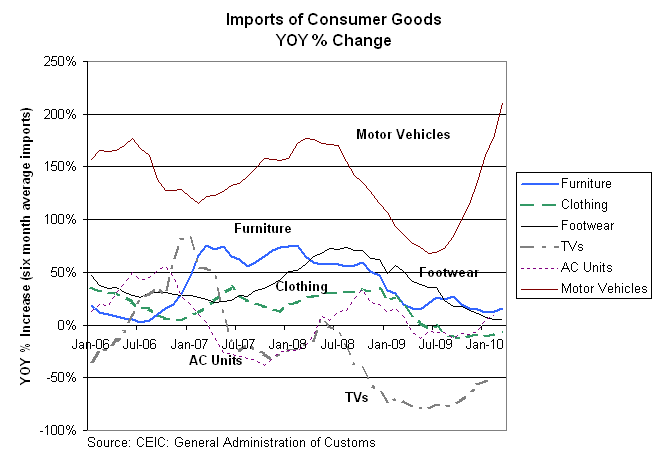 During the same period, imports of furniture and footwear increased by 15.4% and 5.3%, respectively, but clothing imports declined by 6.9% (see Chart 5). During the six months between September 2009 and February 2010, imports of air conditioners increased 9.0% but imports of televisions declined 54.6% from the same time period last year. In short, with the exception of motor vehicles, imports of consumer goods remained relatively weak, with some areas showing modest gains and others showing losses. At first glance, increased imports of motor vehicles would tend to support the argument that China is rebalancing. But on closer examination, one would see that the demand for cars has been driven by a government strategy to develop a strong domestic auto sector, not by a goal of creating a more consumer-oriented economy. Policies to support the auto sector, which included significant subsidies for purchasers and producers of fuel efficient vehicles, were partly responsible for dramatic increases in sales during 2009 and the first quarter of 2010. While some stimulus to the auto sector will expire in 2010, subsidies will continue for gas vehicles with engines smaller than 1.6 liters; “cash for clunkers” rebates in rural areas of up to 18,000 yuan ($2,632); and rebates for “new energy” cars, or fully electric cars, of up to 60,000 yuan ($8,775). Excessive bank lending since the beginning of 2009 incentivized stockpiling of commodities and materials and the development of spare capacity. A tightening cycle could force enterprises in China to reduce imports and rely on existing commodity stockpiles and excess capacity to increase exports, leading to a rise in the trade surplus. There is a danger, then, that the recent trade figures will temporarily reduce pressure on China to rebalance its economy. Given the likelihood that China’s investment-heavy stimulus will lead to a new surge in China’s net exports, it is even more important that the United States develop a strategy to encourage China to undertake structural reforms to rebalance its economy. Revaluation of the yuan, although no substitute for longer term structural changes, would be a good place to start. There are more charts in the article related to Chinese demand for commodities. I encourage everyone to take a closer look. The important point, but one that the article did not explicitly make is that China's demand for commodities is hugely artificial, predicated on round after round of stimulus and outright monetary printing that has also fueled massive property bubbles and speculation. So before one can even talk about ways to rebalance, global stimulus needs to stop. Yet, China Business says Another $586 billion "Stimulus" Coming to China. The notion the RMB is hugely undervalued is in part predicated on a belief the Chinese economy is a lot better than it is. Indeed, near unanimous opinion suggests the RMB would soar if China floated it. Here's a question to ponder: What would happen if China stopped its stimulus cold turkey, pricked its property bubbles, and allowed the RMB to float freely, and in response the Chinese stock market collapsed, social unrest picked up, and hot money poured out of China? Would the RMB soar in those conditions? I rather doubt it. Yet those conditions are what I would expect if China stopped its speculative bubbles. The way to find out the true state of affairs is for China to float the RMB, central bankers to allow the market to set rates, and for governments worldwide to stop fiscal madness. That is also the way to rebalance the global economy. Unfortunately, central bankers and governments won't take that set of actions, preferring instead to blame China's RMB peg for the world's ills.